Switzerland 2009. 35mm, 1:1.66, Dolby digital, colour, 76 min. 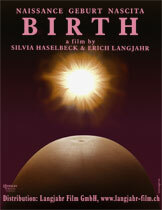 In this film the viewer experiences the birth of a human being as a primal, physical, and sensual experience. In this film the viewer witnesses the birth of a human being as an elementary, physical and sensual experience, participating intimately in the secret of nascent life. The film depicts how women hazard the unpredictable and inevitable, and how they balance their fears and insecurities with a trust in their own rhythm of letting go, biding their time, and reflecting quietly. Thus the film tells a story in which the important moments in a pregnancy are rendered tangible: the communication between the mother-to-be and her midwife, the affection and attachment between husband and wife, and lastly, one of the most intense moments in the life of a human being that is simultaneously bound with joy, pain, amazement and fear. Music Carmela Konrad, Gesang, "Melodien für uns"
The cinema of Eric Langjahr, with whom Sylvia Haselbeck, his wife and mother of two children, has closely collaborated for more than twenty years, is committed to describing gestures and activities in their original movements. Just think of Das Erbe der Bergler (2006), which denotes this taste for sustained observation of these mountain peasants about to disappear. Geburt, co-directed by Sylvia Haselbeck, commences with a figure of the pregnant Madonna (the director herself) and by scenes of grottos and caverns that symbolize the belly of the earth, and consequently the maternal stomach. Then follows a tale of astonishing simplicity, devoted to showing the moments of pregnancy. After some preparatory scenes with parents, breathe deeply!, comes the childbirth, offered at the time of its happening and unhurried by any untimely cut. The cinema creates its own representative rhythm, which has to comply as nearly as possible with the duration of the revealed events. The two filmmakers, who have themselves edited the film, have mastered the art of the ellipses that do not hasten real time. The second part of the film re-adopts and deepens the first. Asserted then is the charismatic personality of Patricia, a wise woman who accomplishes her profession serenely and with an archaic confidence. Her gestures, words and smile invite us to this celebration of life that Langjahr knows how to film from a correct distance and with remarkable restraint. No intrusion into the intimacy of the stages of gestation, but their presence within an immemorial ritual, in which life is in the course of happening. Ultrasound thus becomes a spectacular experience, when we hear the infant in a sudden symphony of beatings. We are witnessing these privileged moments, just as is the so attentive presence of the filmmakers. The maturity of cinematic conception is at work, which knows how to give time to time within the availability of a view that nothing could disturb. Geburt gives birth to the dimension of a natural accomplishment, away from all untimely medicalization. Simply the spectacle of life that is accomplishing its work.